Le rêve de transparence qui traverse la littérature victorienne semble trouver une de ses incarnations dans la figure du flâneur, observateur privilégié de la vie urbaine. Cet article tente d’apporter un éclairage nouveau sur la construction de cette figure fuyante en l’analysant à travers le prisme de trois objets dont le fonctionnement repose sur le principe de transparence. La première partie de l’article dresse un parallèle entre l’image de la vitre et celle du flâneur. Cet examen révèle que celui-ci est bien loin d’être « devenu l’œil transparent » qui « n’est rien » et « voit tout » dont parle Emerson. L’analyse tente donc dans un deuxième temps d’examiner le flâneur à travers le prisme du stéréoscope, qui fait apparaître, en perspective, sa nature de palimpseste. Cette étude se concentre enfin sur la nature du regard du flâneur, dont on pourrait comparer le fonctionnement à celui d’une longue-vue. Pour le flâneur, être « transparent », c’est en fait traduire la modernité de la ville à travers ses pas, son regard et ses mots. Pour voir, percevoir et donner à voir ce rêve de transparence, celle-ci ne peut être absolue, mais doit passer par l’opacité de l’écriture. This article focuses on the dream of transparency which pervaded the nineteenth-century literary cityscape, and which, I argue, is embodied in the figure of the flâneur, the ubiquitous observer of urban life. To shed light on the function and makeup of this enigmatic figure, I analyze the flâneur through the lens of transparency and through the prism of three objects which use transparency as their core functioning principle. I start by considering the idea that the flâneur is akin to a transparent glass pane. However, a closer look at the flâneur reveals him to be far from simply transparent. Beholding him through the lens of a stereoscope brings his multi-layered nature into relief. This paper concludes by examining the flâneur’s vision, which could be said to function like a spyglass. For the flâneur, being ‘transparent’ in the city is ultimately translating modernity through his gaze, footsteps, and words. To see and to give solidity to the dream of transparency, transparency cannot be absolute, but must be mediated and filtered through the opacity of writing. The flâneur as a Polymorphous Devil? The flâneur as a Dialectical Image? 1Anthony Vidler has shown that the ideal of transparency is one of the myths which underlie modernity: ‘Modernity has been haunted, as we know very well, by a myth of transparency: transparency of the self to nature, of the self to the other, of all selves to society’ (Vidler 217). As London and Paris are the undisputed nineteenth-century ‘capitals of modernity’ (to borrow Harvey’s expression), it seems appropriate to examine these cities through the lens of transparency. 2This article will focus on the dream of transparency which pervaded the nineteenth-century literary cityscape, and which, I argue, is embodied in the figure of the flâneur, the ubiquitous observer of urban life. The etymology and different meanings of the word ‘transparency’ might shed light on both the function and makeup of this enigmatic figure who has become an epitome of modernity. 3According to the OED, the early English use of the word ‘transparent’ meant ‘to render bodies lying beyond completely visible’. The flâneur, a literary figure through whose eyes we see the city, calls attention to this scopic dream—he literally makes the city visible and transparent. The appearance of the flâneur on the literary scene creates an opening through which readers can peer at the city as they would through a glass pane. It might then be useful to turn our gaze to the flâneur himself, to examine what ‘dreams he is made on’. Stereoscopic vision, I will suggest, might be the best way to approach and decipher this enigmatic figure. Indeed, if one examines the makeup of the flâneur, one can make out, beneath his smooth, modern appearance, the palimpsestuous layers of all the scopic figures who came before him. The flâneur, it seems, might not be completely transparent after all. However, he is transparent enough ‘to allow the passage of something, to have the property of transmitting light’ (OED). Rather than seeing him as a medium that allows us to see the city without distortions, one might consider him as a sort of spyglass for readers. And a spyglass inevitably transforms our vision. It sheds a different light onto the cityscape—it adds to the city-text—or subtracts elements from it. I will suggest that the transparent flâneur might ultimately be the translator of the urban text. 4I need to say a few words on the material I have chosen to focus on for this article. The flâneur was first portrayed in physiologies, a hugely popular genre of illustrated sketches that depicted social types in a witty manner. Anthologies of physiologies such as Paris ou Le Livre des cent-et-un or England and the English proliferated in the 1830s and 1840s. Margaret Rose has shown how physiologies such as Smith’s The Natural History of the Idler upon Town prove that the aesthetics of flânerie travelled from Paris to London. As it is important to trace the flâneur before it appeared in the pages of the novel, to understand where it grew from and how it traversed the literature produced in both capitals, I will start by examining these physiologies. 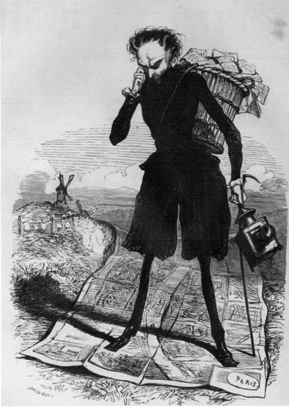 The flâneur, although never explicitly designated as such, figures prominently in the work of Charles Dickens.1 Figures such as Boz, Master Humphrey, or the Uncommercial Traveller immediately spring to mind. However, as it is impossible to do justice to the magnitude of his work upon the subject within the confines necessarily imposed upon a paper, I shall conduct a case study of one specific Dickensian flâneur. I will focus on Master Humphrey, a curiously transparent flâneur who weaves in and out of the canvas of The Old Curiosity Shop. 5Nineteenth-century literature and culture seem to have been pervaded by a scopic dream, which aimed at making all surfaces transparent, and was signified in the pervasive presence of two figures: that of Asmodeus and that of the flâneur. De Certeau, in ‘Marches dans la Ville’, establishes a useful opposition between two modes of apprehending the city. On the one hand, there is the all-encompassing aerial viewpoint of the map-makers and city planners, which renders the city legible and comprehensible, which one might compare to the gaze of Asmodeus, the omniscient devil. On the other hand, there is the walker’s perception of space at ground-level which inevitably remains illegible and has to be apprehended through a rhetoric of walking. Many urban narratives of the period adopt both types of gazing, and the omnipresence of both Asmodeus and the flâneur in urban discourse seems to be a symptom of this ideal of transparency. 6Asmodeus first appeared on the Parisian literary scene in 1707 in Lesage’s Le Diable boiteux. In this tale, the devil takes the nobleman Don Cleofas on a nightflight over Madrid as a reward for having released him from a glass phial. Perched on top of churches, this literary devil had the power to see through the rooftops of the city and peer into the life of his contemporaries. A modern-time Argus Panoptes, his position and powers meant that he could grasp the city from above in a single glance. 7One might see Asmodeus as a satiric device which Lesage used to criticise society by exposing its hypocrisies. The choice of a devil’s eye view of the cityscape, which reverses the traditional God’s eye view of the world, foregrounds the satirical tone of the text as well as the intent to inspect and see through social conventions. Transparency is one of the most enduring ideals from the Enlightenment. This distanced, sharp and satirical gaze which sees through the surface of things and elicits questioning and knowledge in the mind is a quintessential part of the philosophie des Lumières. Asmodeus is also the physical embodiment of Bentham’s panoptic gaze described by Foucault, but in this case, it is a positive one. The devil is also intent on teaching Cleofas how to see and think clearly, which points to the text’s instructive purpose. The eighteenth-century devil is associated with unveiling, exposing and divulging. His distanced gaze is the instrument which gives us the true measure of man and of his city. Now to bind all this together, and to get a character established as it were which any of the writers may maintain without difficulty, I want to suppose a certain Shadow, which may go into any place, by sunlight, moonlight, starlight, firelight, candlelight, and be in all homes, and all nooks and corners, and be supposed to be cognisant of everything, and go everywhere, without the least difficulty. Which may be in the Theatre, the Palace, the House of Commons, the Prisons, the Unions, the Churches, on the Railroad, on the Sea, abroad and at home: a kind of semi-omniscient, omnipresent, intangible creature. I don’t think I would call the paper The Shadow: but I want something tacked to that title. 9This passage underlines the omniscience of the Asmodean gaze. One might note that Asmodeus, from being the central narrative authority through whose eyes readers could apprehend the city, is moved to the margins of the text. He only appears in titles or prefaces—or paratext—to guide our interpretation. Asmodeus’s presence reaffirms the scopic drive, but its displacement to the threshold of the text also hints at the gradual eclipse of the synthetic mode of gazing over the city. The hero of the physiologies themselves—and eventually, of the novel—becomes the flâneur. The power to make opaque surfaces transparent is transferred from Asmodeus to the flâneur. Indeed, discourses that develop around the flâneur heavily dwell upon the penetrating quality of his gaze. In 1812, Etienne de Jouy’s Hermite de la Chaussée d’Antin, a famous flâneur avant la lettre, explicitly compares himself to Asmodeus. In one chronicle, he even peels off the facade of the building to reveal what is inside. The flâneur is endowed with Asmodeus’s supernatural power to see through walls, or through the layers of the palimpsest—he is the archaeologist who makes the layers of the past visible. 10The Argus-like flâneur is not only endowed with panoptic powers. Like The Invisible Man, he also has the power to be transparent himself. Only by being the transparent medium through whose eyes we see the city does he become the perfect embodiment of the scopic dream. Being see-through himself, he allows readers to take on his empty shell to see with and through him. This transparent flâneur does not impose his physical presence on us, and carries within him the notion of being unencumbered. One can slip into his shape and take up his stance because he has become undetectable. 11Indeed, the physiologies constantly stress the flâneur’s inconspicuousness—he is, paradoxically, an invisible type. The flâneur’s characteristic polymorphism—to which I shall come back later—also contributes to making him anonymous—or transparent. The physiologist of ‘Le flâneur à Paris’ describes the flâneur as someone who sheds his real identity as soon as he steps out onto the pavement. Physiologies give painstakingly precise elements of description of the flâneur’s outward appearance which are accompanied by illustrations which all represent the flâneur as a well-dressed man in a black coat and a top hat, carrying a walking stick or an umbrella. This, however, is nothing more than the public, official attire of the typical city bourgeois. Smith, by drawing up a list of types that may fit into the category, effectively demonstrates the ‘transparency’ of the figure: ‘So, loitering flâneurs, we warn you all . . . he may be at your elbow when you least expect it. The simple pavement-beater of Regent Street; the listless bachelor of small independence . . . the dangler about the coulisses of the theatres, and the pit lobbies of the operas; the quiet “mooners” about the streets, and the frequenters of the tranquil old Fleet Street taverns’ (Smith in Rose 6–7). The more physiologists accumulate descriptions and sketches of what he is and is not, the more obscure, opaque—and thus invisible and transparent—he becomes. 12Paradoxically, physiologies of the flâneur strove to define, describe and pin down a figure who was utterly unrecognizable in his outward appearance—a figure, in fact, who might even be seen as the most elusive of city types. His rigorously correct, public apparel makes him opaque—or curiously transparent. He is a mirror of the society he observes, and functions like one. His opaque attire, like the opaque layers of a looking-glass, is necessary to create this mirror-image of the public that circulates through the city. This opacity is a protective shell which transforms him into a transparent vehicle through whose eyes we may explore the city. He is a positively invisible man as opposed to the death-like invisible man at the end of the century. His transparency of vision implies that his gaze is marked by the ‘innocence of the eye’ which characterizes artists for Ruskin (Ruskin 5). There is a sort of drive to the dematerial in the nineteenth century in which dense matter is overcome by a desiring gaze. Is he, in the words of Virginia Woolf, only ‘a central oyster of perceptiveness, an enormous eye’ (Woolf 178)? We must turn that scopic gaze to the flâneur himself to answer this question. 13During the first half of the nineteenth century, the flâneur and Asmodeus progressively become amalgamated, and the flâneur comes to dominate the discourse of the physiologies and novels. Increasingly, he centralizes both modes of gazing and becomes the epitome of the nineteenth-century scopic drive. However, I would like to show that Asmodeus does not disappear: residual traces of the Asmodean gaze remain in the flâneur’s makeup. He is a palimpsestuous figure made of successive, translucent layers. 14As the century progresses, the distinctions between both figures gradually break down and the figure of Asmodeus seems to merge and morph into that of the flâneur. He becomes the figure who is capable of both being immersed in the crowd and beholding it from a distance. The devil and the flâneur are both described as age-old shape-shifting figures traversing the centuries unscathed. 15This blurring between both figures is admirably illustrated in Gavarni’s frontispiece to Hetzel’s Le Diable à Paris (figure 1). The engraving brings together Asmodeus’s fiendish attributes (the cloven foot, the horns) with the sartorial elegance of the flâneur (the inconspicuous, tailored black suit, the elegant cuffs and boots). More importantly, the panoramic perspective of the map-maker, which is signified in the towering presence of Flammèche over the map of Paris, is combined with the keen and detailed gaze of the flâneur, which is signified in the metonymy of the monocle. Subsequent physiologies embraced this ‘downward’ movement in which the city observer steps down from the rooftops to penetrate the city streets. In the 1845 Le Diable à Paris, Satan sends his most faithful demon Flammèche to explore Paris and chronicle ‘everything that is, diabolically speaking, possible to know about [Paris]’ (Hetzel, I, 23) to overcome the panoramic survey’s shortcomings. Flammèche could be seen as a transition figure, an Asmodeus-like figure stepping down from his all-seeing position to descend into the city streets and don the attire of the flâneur. By the 1850s, the flâneur has replaced Asmodeus as the presiding figure who reigns over the texts of Parisian anthologies. He has absorbed the Asmodean attributes and internalized the panoptic gaze. Yet, the figure of the devil lurks beneath the modish and affable surface of the urban pedestrian. One can discern the Asmodean heritage under the thin veneer of the modern appearance of the flâneur, who clearly appears as a multi-layered figure. 16Interestingly, these Parisian figures circulate and travel to London, and The Old Curiosity Shop provides a good example of this transfer. The novel opens with a peculiar narrator, Master Humphrey, who, like Dickens, explains his night-walking from his inability to sleep. For this London flâneur, pacing the city-streets at night is a fate which is a relief from the torments of insomnia. Interestingly, after the first three chapters, he disappears, after which the omniscient, Asmodeus-like narrator takes over. 17In Dickens’s work, one notes a permanent to-and-fro movement between omniscience and the flâneurial viewpoint. The Old Curiosity Shop illustrates this transition most clearly. Once Master Humphrey has served his purpose and introduced Nell and other major characters, he retires from the scene to let the objective, third-person narrator take over. In chapter 33, the narrator mentions Asmodeus, in a metatextual gesture which points to the text’s own omniscience—or desire for omniscience: ‘The historian takes the friendly reader by the hand, and springing with him into the air, and cleaving the same at a greater rate than ever Don Cleophas Leandro Perez Zambullo and his familiar travelled through that pleasant region in company, alights with him upon the pavement of Bevis Marks’ (OCS 250). It is night. Calm and unmoved amidst the scenes that darkness favours, the great heart of London throbs in its Giant breast . . . Draw but a little circle above the clustering housetops, and you shall have within its space everything, with its opposite extreme and contradiction, close beside. Where yonder feeble light is shining, a man is but this moment dead . . . . Does not this Heart of London, that nothing moves, nor stops, nor quickens,—that goes on the same let what will be done, does it not express the City’s character well? 19Here, Master Humphrey combines the age-old, panoptic gaze of Asmodeus with the specific gaze of the flâneur which closes in on minute details. I shall now resort to visual analysis to attempt to understand the relationship between these two figures. 20I will use an 1853 daguerreotype by Charles Nègre, entitled ‘Le Stryge’ (figure 2) to deconstruct the nature of the flâneur—or rather, to explore the multi-layered nature of this construct. After showing how the image manages to encapsulate the fusion of Asmodeus and the flâneur, which points to this shift of paradigm in urban vision, I will explore the archaeological nature of the image to understand how the historic depth of both figures affects the construction of the flâneur. This will lead me to propose that the flâneur, just like this daguerreotype, functions like a dialectical image. 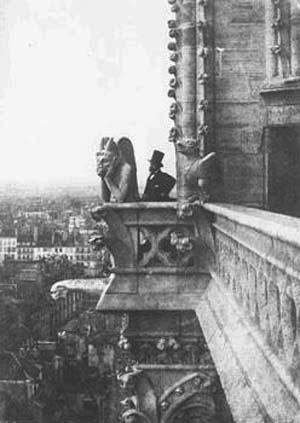 21Nègre’s image, which shows a melancholy—looking gargoyle side by side with a flâneur—like gentleman gazing at the city, suggests that the latter reconciles both types of vision. Taylor Lerner seems to corroborate this analysis: the urban observer, from being a somewhat passive figure, has morphed into a skilled observer of city life, who has adopted the Asmodean panoptic gaze and who is also endowed with the power to move about the city, and fathom out the layers of the urban palimpsest. He captures the essence of modernity and enables his contemporaries to understand it. In Nègre’s photograph, one might say that the prostrate and despondent creature is lost in the labyrinth of his own mind and is incapable of interacting with and apprehending the bustling city which lays at his feet, whereas the flâneur standing next to him has come up to his level to apprehend the teeming expanse which spreads beneath them. The ascent of the flâneur thus points to a city-observer who is much more involved in the hermeneutic deciphering of the city space. This interpretation endorses the view that the flâneur’s gaze is more powerful than ever. The juxtaposition of both figures makes the flâneur into the modern double of Asmodeus, reminding us that the flâneur is a descendant of the devil. This image brings to light the palimspestuous nature of this modern literary figure who appears in the periodical press and who, by morphing into a new shape, overshadows its earlier forms. The flâneur, like Asmodeus, is a figure of endless transformation, who is defined by polymorphism—but whose superiority lies in his capacity to combine the close, precise gaze of the urban stroller with the panoptic gaze of the devil. 22This image is, in a sense, archaeological. The medieval presence of the gargoyle is symbolic of a gesture that looks back to the past. It seems to suggest that looking to the past might be a key to unlocking the mysteries of the present. These archaeological overtones take Asmodeus and the flâneur apart again. It suggests that they are separate figures existing in different times precisely around the period when Asmodeus is on the brink of extinction and seems to have been subsumed by the flâneur. In this image, the traces of the old in the new are made evident, not least in the use of the recently developed daguerreotype technique. The medieval nature of Asmodeus is not only reinforced by its contrast with the modern flâneur, but also by several other elements. The city spreading around them is strikingly reminiscent of a site excavation. The photograph was taken in 1853, which is the year Haussmann launched his Renovation of Paris. Paris was re-discovering its past at the same time as it was asserting, constructing and literally building up its modernity. As a result, the period was marked by a resurgence of the medieval. The idea of the ‘Vieux Paris’ was thus essentially a product of the city’s modernisation, which was uncovering what lay below the surface. 23I would say that Nègre’s photograph encapsulates, in visual terms, ‘the movement of a cradle rocking back and forth between modernity and the [medieval age]’ (Benjamin 1999, 356) which leaves its mark on Paris during that period. The quasi-archeological layers of the cityscape in the background remind us that the city’s past lurks right below its surface, and reflect, on a different plane, the archeological makeup of the flâneur. All the gazing figures who preceded him are ancestral layers which are part of the imagined historicity of the flâneur and underlie our perception of the figure. There is an interesting reciprocity here between subject and object—between the flâneur himself and the city he is gazing at. Moreover, the physical proximity between the gargoyle and the modern gentleman standing next to him seems to point to the dialectical relationship between past and present which constitutes the essence of the flâneur. The historical depth of the image thus destabilizes its meaning, and brings out its dialectical nature. In the light of this, Lerner’s initial reading of the photograph has to be reconsidered. 24Indeed, I would also argue that one might also read the image differently and see the presence of the melancholy gargoyle as undermining the idea of omniscience. Nègre’s photograph emphasizes the historicity of Asmodeus. The medieval nature of the gargoyle reminds us that the devil was originally the agent of deceptive vision, illusion, delusion and hallucination.Indeed, the devil had ‘the power to adopt any bodily form or shape whatever, the power to create exact simulations of people and events, and, above all, the power to disrupt the cognitive process itself by physically entering either brain or eye or both and moving images around them at will’ (Clark 3). In the eighteenth century, he became the agent of distanced clear-sightedness. That vision is revised and transformed yet again by nineteenth-century physiologists, who deem the devil’s panoptic vision insufficient. Asmodeus, then, becomes the embodiment of abysmal doubt, which his posture seems to denote. I would suggest that the presence of the petrified Asmodeus also hints at the impossibility of ever fully apprehending the city. His half satirical, half-melancholy presence might be the recognition of the limits of the gaze, which might see the most when it accepts and confronts what it cannot fully comprehend. On the one hand, the ghostly and antiquated presence of Asmodeus erodes the polished surface of the all-seeing flâneur. On the other hand, it bestows depth and wealth of meaning on the flâneur. The photograph’s interest lies precisely in the fact that it does not reconcile opposites, but upholds the ambiguity of the flâneur’s gaze and position within the city. 25To understand how this dialectical image functions, one might look at it as one would through the transparent lenses of a stereoscope. Wheatstone’s 1838 invention was, according to Crary, the most significant form of visual imagery in the nineteenth century. This device combines two images that are side by side to produce a three-dimensional depth perception. Stereoscopic viewing joins two disparate images together and brings them into relief. It is ‘an operation of reconciling disparity, of making two distinctive views appear as one’ (Crary 120). The daguerrotype offers us the possibility of viewing the disparate images of Asmodeus and the flâneur stereoscopically—it merges the figure of the devil with that of the modern viewer while simultaneously throwing them into sharp relief. The stereoscope uses persistence of vision, ‘the continuance of a sensation after the stimulus which caused it is removed’ (OED). Similarly, Asmodeus persists through the flâneur after it has vanished from view. The functioning of the device matches that of Nègre’s image. Stereoscopic viewing gives us ‘an insistent sense of “in front of” and “in back of” that seems to organize the image as a sequence of receding planes’ (Crary 125). The flâneur symbolically stands in front of Asmodeus, whose presence brings both figures into relief. The daguerreotype, like a stereoscopic image, offers itself ‘with a hallucinatory clarity, but when taken together [the two figures] never coalesce into a homogeneous field. Part of this fascination of these images is due to this immanent disorder’ (Crary 126). Crary’s observation here underlines the instability of the flâneur as a construct, who is a constantly-evolving, Protean figure. His remark also reminds us that the shifting perspectives from which we behold the flâneur are part of its construction. The stereoscope, once again, helps us understand how we perceive this figure, and points to the importance of the notion of time as well as space. As well as underlining the temporal and historical depth of the figure, the stereoscope shows us that to perceive this reconstructed, three-dimensional figure, we, as readers, need time to adjust our vision: ‘Stereoscopic vision gives both time and space their due, for the coordination of the two images requires a minute delay in perception’ (Jay 184–5). This also implies that the flâneur too must adjust his vision to the multi-layered cityscape. The idea of immanent disorder, of discrepancy inherent in the flâneur’s perception as well as our perception of the flâneur goes against the idea of transparency. What happens to the scopic dream, then, if the flâneur is not absolutely transparent? 26The flâneur, then, is not purely transparent—he does not make the city ‘manifest, evident, obvious and clear’ (OED), or restore it without distortions. I would like to argue that he is more of a spyglass for readers. However, the notion of spyglass brings to mind the notion of mediation, of diffraction and refraction—it signifies a change, or a shift in perspective. The Latin prefix ‘trans’, which means ‘across’, evokes ‘an active movement that cuts across, or goes to the farther side’ (OED). The implication is one of action, motion or motivation. By constantly morphing into modern, ‘transparent’ shapes and outwardly shedding its former shells, the flâneur takes us through the changes that affect the nineteenth century and displaces the urban gaze. By doing this, he is also articulating or translating the complexity of urban experience to make it shareable and accessible. 27The flâneur is the reader and interpreter of modern life. We need the experience of the city to be mediated, to be refracted through the lens—or monocle—of the flâneur to be able to apprehend modernity. The flâneur interprets and reorganizes the city’s images and messages to make it intelligible. Benjamin wrote that ‘a real translation is transparent; it does not cover the original, does not black its light, but allows the pure language, as though reinforced by its own medium to shine upon the original all the more fully’ (Benjamin 2000, 81). We need this literary translation to comprehend modernity—the flâneur is often described as a learned exegete and reader of the urban text: ‘Il y a sous la première enveloppe de chaque chose des rapports inconnus, des aperçus ignorés, tout un nouveau monde d’idées, de réflexions et de sentiments qui s’éveillent et jaillissent tout à coup sous le regard exercé de l’observateur, comme la source cachée sous la sonde du géologue’ (Lacroix 71–2). The discourse of and about the flâneur allows the passage and apprehension of modern experience. His task is to translate the complex and elusive urban modernity. According to Benjamin, the “modern” is as varied in its meaning as the different aspects of one and the same kaleidoscope’ (Benjamin 1999, 545). We need this modernity to be filtered through a conscience, through the opacity of writing to apprehend it. 28Let us now examine Master Humphrey’s translation of his experience of London. We are seeing London through his eyes, but from the very beginning, he tells us that his night-walking gives him ‘opportunity of speculating upon the characters and occupations of those who fill the streets’ (Dickens 2000, 9). The word ‘speculate’ is particularly interesting here because it encapsulates what Master Humphrey’s flânerie effectively does. At first sight, Master Humphrey is the transparent shell who walks us through the London streets—he is all eyes for us. Indeed, this is precisely what the now obsolete meaning of ‘to speculate’ implies: ‘to look at, gaze at something; to examine, inspect, or observe closely and narrowly’ (OED). However, the current use of the word indicates that he does not only record the city for us. To speculate is, above all, ‘to observe or view mentally, to consider, examine, or reflect upon with close attention; to contemplate; to theorize upon’. Thus, Master Humphrey is not only reading the city, he is primarily re-reading—or translating—the city-space. In his insomnia, the mental spaces and the metropolis become inseparable, and the following passage illustrates how much re-writing his night flânerie actually entails: ‘A glimpse of passing faces caught by the light of a street-lamp or a shop window is often better for my purpose than their full revelation in the daylight; and, if I must add the truth, night is kinder in this respect than day, which too often destroys an air-built castle’ (Dickens 2000, 9). Transparency, ‘the property of transmitting light’, is of no concern—if anything, daylight is an obstacle. The passage shows that he is looking for something hidden, and by reading and re-reading the streets, he is effectively re-writing London. He is literally translating the urban experience through the prism of his own curiosity and speculations. For De Certeau, physical circulation across the city, with its associated mechanisms of dreams, memories and fables, is the key to unlocking the urban experience. Master Humphrey’s meandering writing reflects and translates his own physical and mental flâneries. Speculation is at the heart of the text Master Humphrey is writing with his footsteps. His flânerie pays off since he does stumble upon a curiosity—Little Nell—and a story. Far from being a mere see-through window open onto the modern city, the flâneur is more like a spyglass. We can only have a ‘transparent’ access to the city when it is refracted through the opacity of writing. 29This paper has examined the flâneur through the lens of transparency and through the prism of three objects that use transparency as their core functioning principle. Starting with the metaphor of the glass pane and an overview of the nineteenth-century scopic drive, and narrowing its angle gradually to focus on the stereoscopic makeup of the flâneur, it closed in on the flâneur’s mode of vision, which, it suggested, might be said to function like a spyglass. One might argue that the scopic dream could best be encapsulated through the metaphor of the glass pane. Indeed, constructions of the flâneur are underpinned by this dream of a crystal-clear, all-seeing, and penetrating vision, which implies that he is akin to a transparent glass pane himself. However, a closer look at the flâneur reveals him to be far from simply transparent. Beholding him through the lens of a stereoscope brings his multi-layered nature into relief—and focus. If we shift our focus away from his construction to close in on the flâneur’s vision, the comparison with a spyglass becomes increasingly apt. For the flâneur, being ‘transparent’ in the city, is ultimately translating modernity though his gaze, footsteps, and words. The opaque ‘locust swarms of writing’ to which Benjamin refers do not ‘eclipse the sun’ (Benjamin 1979, 62) but, on the contrary, embody the abstraction of the flâneur’s gaze—they ‘allow pure language to shine upon’ the city. To see and to give solidity to the dream of transparency, transparency cannot be absolute, but must be mediated and filtered through the opacity of writing. Benjamin Walter, One-Way Street and Other Writings, trans. Edmund Jephcott, Kingsley Shorter, London: NLB, 1979. Benjamin Walter, The Arcades Project, trans. Howard Eiland, Kevin McLaughlin. Cambridge: Belknap of Harvard UP, 1999. Benjamin Walter, ‘The Task of the Translator. An introduction to the translation of Baudelaire’s Tableaux parisiens’ , trans. Harry Zohn, 1968, The Translation Studies Reader, ed. Lawrence Venuti, London: Routledge, 2000, 75–83. Clark Stuart, Vanities of the Eye, Oxford: OUP, 2007. Crary Jonathan, Techniques of the Observer: On Vision and Modernity in the Nineteenth Century, Cambridge, London: MIT Press, 1992. De Certeau Michel, L’Invention du quotidien; arts de faire 1, Paris: Gallimard, 1990. Dickens Charles, Master Humphrey’s Clock, London: Chapman & Hall, 1840. Dickens Charles, The Old Curiosity Shop (1841), London: Penguin Classics, 2000. Forster John, Life of Charles Dickens (1872–4), Uitgeverij: Diderot, 2005. Hetzel Pierre-Jules (ed. ), Le diable à Paris, 2 vol., Paris: Hetzel, 1845–46. Jay Martin, Downcast Eyes: The Denigration of Vision in Twentieth-Century French Thought, Berkeley and Los Angeles: U of California P, 1993. Lacroix Auguste, ‘Le Flâneur’, Les Français peints par eux-mêmes: Encyclopédie morale du dix-neuvième siècle, vol. 3, ed. Louis Curmer, Paris: Curmer, 1840–1842. Rose Margaret A. (ed. ), Flâneurs & Idlers: Louis Huart, ‘Physiologie du flâneur’ (1841); Albert Smith, ‘The Natural History of the Idler upon Town’ (1848), Bielefeld: Aisthesis, 2007. Ruskin John, Elements of Drawing (1857), London: George Allen, 1895. Taylor Lerner Jillian, ‘A Devil’s-Eye View of Paris: Gavarni’s Portrait of the Editor’, Oxford Art Journal, 2008, 31 (2). Vidler Anthony, The Architectural Uncanny: Essays in the Modern Unhomely, Cambridge, Mass. : MIT Press, 1992. Woolf Virginia, ‘Street Haunting: A London Adventure’ (1930), Virginia Woolf, Selected Essays, ed. David Bradshaw, Oxford: OUP, 2008. Figure 1—Paul Gavarni, Frontispice of Le Diable à Paris, 1844–1846, wood engraving, in P.-J. Stahl [Hetzel]. Le Diable à Paris, 2 vol. (P.-J. Hetzel: Paris, 1845–1846), I. Figure 2—Charles Nègre, Le Stryge, 1853, calotype, gelatin-silver print, musée d’Orsay, Paris. 1 Smith, who popularized the figure of the flâneur with the 1848 The Natural History of the Idler upon Town, was friends with Dickens. 2 Jillian Taylor Lerner has shown how physiologies of the period created a composite portrait of authorial expertise by blending the figures of the lame devil, the ragpicker and the editor. Estelle Murail is currently a joint-supervised Ph.D. student at université Paris-Diderot and King’s College London. Her Ph.D. is entitled ‘Beyond the flâneur: Walking, Passage and Crossing in Paris and London in the Nineteenth Century’. She is also agrégée and ATER at the université Paris-Est Marne-La-Vallée. Estelle Murail est doctorante en littérature britannique, inscrite en cotutelle à l’université Paris Diderot et à King’s College London. Sa thèse s’intitule « Au-delà du flâneur : marche, passage et croisements à Paris et à Londres au dix-neuvième siècle ». Elle est agrégée d’anglais et occupe les fonctions d’ATER à l’université Paris-Est Marne-La-Vallée.